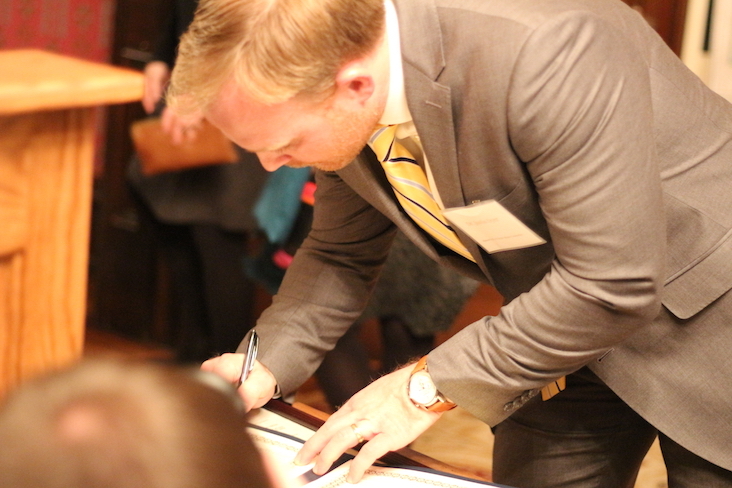 Thanks to the hard work of our longtime collaborator Dr. Steve Belko, Executive Director of the Missouri Humanities Council, the Kinder Institute has officially entered a statewide alliance of six nonprofit organizations and government agencies mutually committed to developing educational, community outreach, and scholarly research projects and events related to the Missouri Bicentennial. 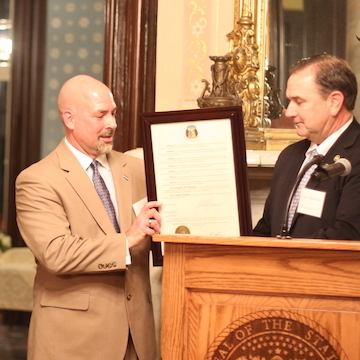 Representatives of each alliance organization joined Missouri First Lady and Kinder Institute affiliate faculty member Prof. Sheena Greitens, Missouri State Senator Mike Kehoe, and Missouri Secretary of State Jay Ashcroft on the evening of January 8 for a signing ceremony held at the Governor’s Mansion in Jefferson City. Kinder Institute contributions to Bicentennial programming will commence more or less immediately, with faculty and graduate students, as well as undergraduates in Prof. Christa Dierksheide’s Spring 2018 “History in the Public” seminar, collaborating throughout the semester on producing content for the Missouri Humanities Council’s “Missouri History, Struggle for Statehood” traveling exhibit. In addition, the Institute will bring major scholars of nineteenth-century America from around the globe to Columbia for a series of academic workshops (2019) and public talks (2020) that will culminate in the 2021 publication of a multi-authored collection of historical essays on the Missouri Crisis of 1818-1821, to be released on the Institute’s Studies in Constitutional Democracy book series with University of Missouri Press. Prof. Pasley, who will spearhead these efforts, described how the Kinder Institute “was created for” this kind of ambitious project and how it marks a long overdue scholarly re-engagement with a defining moment in the complex, turbulent history of the early United States. 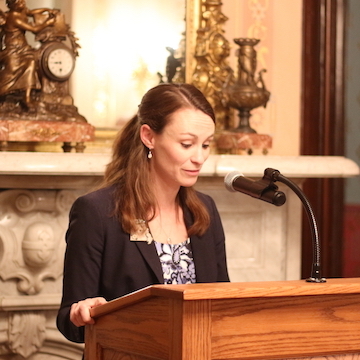 Joining the Kinder Institute and Missouri Humanities Council on the state’s Bicentennial Alliance are the Missouri Council for History Education, Missouri History Museum, Missouri State Archives, and The State Historical Society of Missouri.